A Dallas nurse who recovered from Ebola was reunited with her dog Bentley, after it was quarantined when she was sick with the virus. 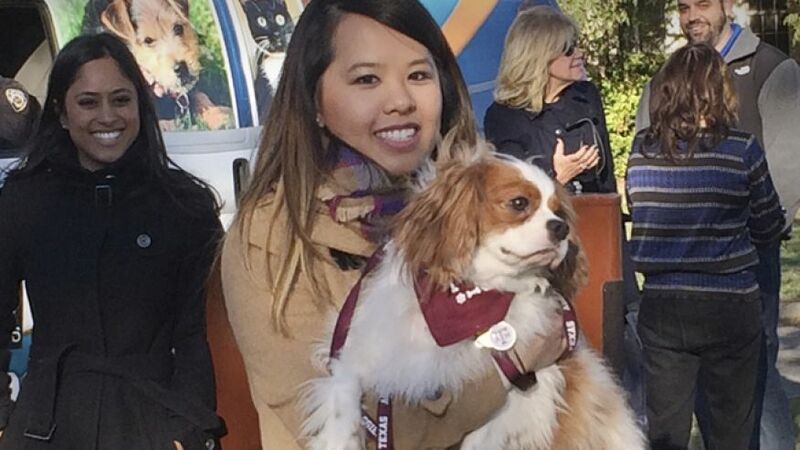 Nina Pham and Bentley were rejoined privately Satuday in a vacant residence where officers once lived at a decommissioned naval base. The King Charles Spaniel was quarantined for 21 days as veterinarians in full protective gear checked on it daily. “I’d like to take a moment to thank people from all around the world who have sent their best wishes and prayers to me and Mr. Bentley,” said Pham, who read a statement at a news conference Saturday. Bentley, whom she called “one of my best friends,” was there on a leash. Pham was diagnosed with Ebola last month after caring for Thomas Eric Duncan in a Dallas hospital. Duncan died of the disease Oct. 8. Pham recovered and was released Oct. 24 from a Washington, D.C.-area hospital.